Considered among the most desirable watches ever created, the Cartier Pasha C is beautifully simple in design while still incorporating the intricacies of the celebrated Cartier movement. In fact, it is this commitment to form and function that has propelled all Cartier timepieces to the very top of the horological industry. Made for both male and female wrists, Cartier Pasha C watches feature a restrained elegance that hints at its rich heritage, bringing contemporary collectors a touch of Cartier’s legendary sophistication and style. Inspired by the introduction of early round watches in 1943, the Pasha series from Cartier became extremely popular, with many incarnations being produced. The Cartier Pasha C is just one of these models that in turn has been redesigned and reimagined in numerous ways. However, common to all Pasha C’s is a round, water-resistant case; screw-down crown cap attached to the case by a small chain; and sword-shaped hands that point to four Arabic numerals. These features combine to create a watch of pure utility that never compromises its classical beauty. 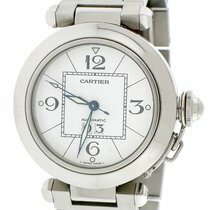 Cartier has long been the choice of the most celebrated social luminaries and respected dignitaries all over the world. It is perhaps no surprise then, that the original Pasha de Cartier was designed exclusively for the Pasha of Marrakech as a watch that he could take into the pool with him. Naturally, this meant that, alongside an aesthetic of nobility and sophistication, the Pasha watch also had to be strong, durable and fully waterproof. This original concept has now manifested itself as the Cartier Pasha C watch featuring water resistance up to 100 meters. The Pasha C de Cartier’s noble parentage is also showcased through its choice of high quality materials, metals, and precious stones. 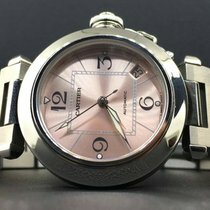 Available in brushed steel or lavish gold (in white, pink, and yellow tones), a Pasha C de Cartier watch showcases Cartier’s illustrious legacy in jewelry design and manufacture. Diamond studded bezels and dials are also available in the range, sometimes mimicking the Pasha’s military influences with a protective grid machined in gold and finished with precious stones. With more than 1000 employees dedicated to producing the finest watches in the world, the Cartier manufacture is highly skilled, highly experienced and highly respected. Each step in the production of a Cartier Pasha C combines the most advanced technology with traditional craftsmanship to harness the best of both worlds. This is underpinned by an uncompromising attention to detail that pushes each and every Cartier watch to the very forefront of horology. Put simply, the Cartier Pasha C watch brings together form and function into one contemporary wristwatch that is both desirable and practical in equal measure.